The M48 Survival Axe is the perfect companion for hiking and camping. With a 37"" overall length, it's great as a walking staff while camping. A cast 2Cr13 stainless steel blade is razor-sharp and can chop through saplings with ease. A 30% fiberglass handle is nearly indestructible and the axe head is attached to it with three separate metal bolts. Do you own or have you used the M48 Kommando Survival Axe Tactical Hiking Staff? If so, rate it! You might actually be surprised to know what tools come with this type of handle. First though before we get into that let�s talk a bit about what this is for those who may not know. Basically a tool that has a sure grip rubberized handle more than likely has a handle with only the top layer being covered in sure grip rubber. This type of rubber not only gives you a firm grip (think rubber tires on wet roads sort of grip) but it also reduces the amount of shock that you receive when using the tool in question. From what was just described as well as your familiarity with tools, what sort of tools do you think would have this sort of handle? Hammers are what might first come to mind. There are other tools with this sort of handle too and one that might even surprise you, but we will save that one for now. Axes are a type of tool that is available with a sure grip rubberized handle. It is important that there is some type of handle that you can get a good grip on with this tool in particular because of the danger involved if it flies out of your sweaty hands. That is also absorbs some of the shock from impact is just a plus. Now, surprisingly there are tomahawks with this type of handle. Tomahawks are more associated with wooden handles but it is possible to find some like this. While they are typically used for throwing a good grip means that you will not lose your grip on it in the process and scalp yourself! For more information on this and other bladed items check out what is going on at Tomahawk Database. 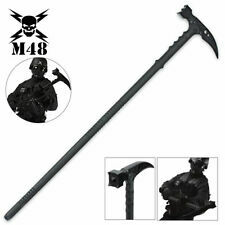 Have you or someone you know purchased or used the M48 Kommando Survival Axe Tactical Hiking Staff? How did it work? Share with the community!